First thing, let’s get this straight: I don’t care how you pack. 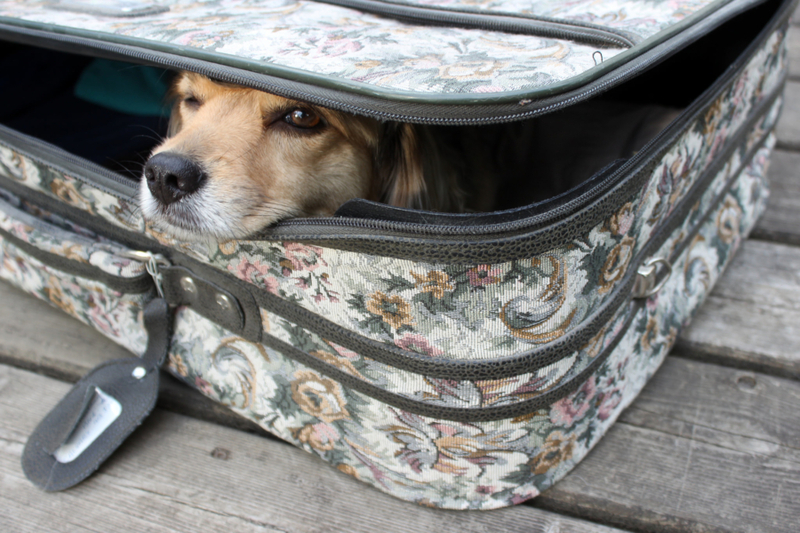 You want to travel carry-on only? Great. You plan on checking a bag? Excellent. Checking two bags, a bicycle, sports equipment, or a big, beautiful golden retriever? Awesome. However you pack, I’m behind you all the way. Because, frankly, getting all passionate about whether you should try to fit your life into a carry-on bag and judging people for taking the things that they need seems like a misuse of passion and a big ‘ol waste of energy. So this isn’t one of those blogs that’s going to try and convince you that there’s a right and a wrong way to pack your bags and head to Europe. It’s not a place where you’ll find one-size-fits-all strategies for making sure you have exactly what you need abroad, nothing more or less. Because here’s the truth: we’re all different. Our values are different. Our needs are different. The things that bring us joy are different. And your packing should reflect you. When it comes to packing, that’s the foundational truth: if you use the stuff in your bag, you’re doing it right. Team Chigilu: Packing Light Since Never (the big bags are bicycles). I carry a curling iron, a pair of scissors, and a fancy red dress. Some people would never use these things, but I use them all the time. An acquaintance of mine showed up in my Instagram feed last week in a gorgeous gold-sequined dress; she also takes at least two hats on every trip. 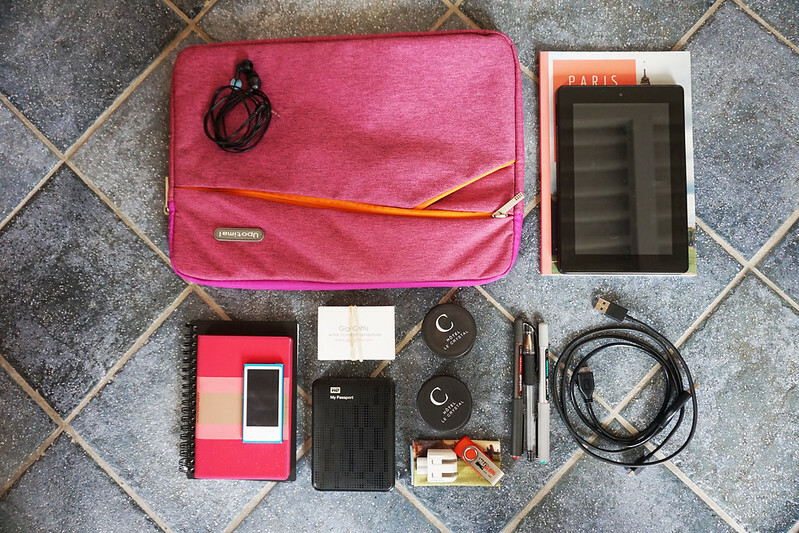 Not everyone would pack those things, but she does…and her travels are happier for them. Another friend travels full-time with paragliding and BASE jumping gear, still another with a bicycle, a third carries a chef’s knife, and a fourth a French press coffee maker. Despite what the carry-on-only-or-bust travel bloggers will tell you, there are a whole lotta different ways to do this long-term travel thing. But enough philosophy. People ask me all the time what’s in my bag, so today I’m posting an update. Clothes: 2 skirts, 3 dresses, 1 pair jeans, 1 pair leggings, 2 pairs tights, 6 tank tops, 2 short-sleeve blouses, 1 vest, 3 sweaters, 1 long-sleeved shirt, 8 pairs cycling socks, 2 pairs thick wool socks that I wear as slippers indoors, underthings, 2 tennis skirts, 2 hats, 1 pair gloves, 1 scarf, 1 winter coat, 1 purse, 1 swimsuit. Shoes: 1 pair boots, 1 pair sneakers, 1 pair converse, 1 pair flats, 1 pair flip flops. 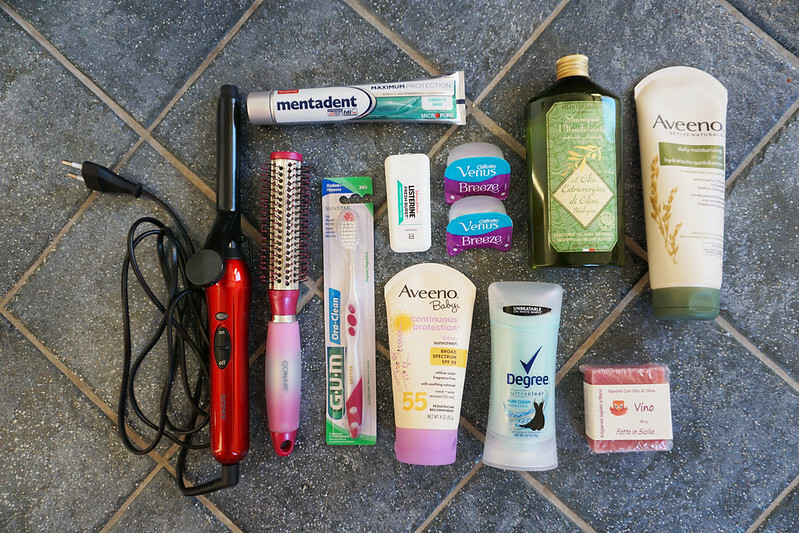 Toiletries: curling iron, brush, toothpaste, toothbrush, floss, mouthwash (not pictured), razors, shampoo, deodorant, baby sunscreen, soap, lotion. 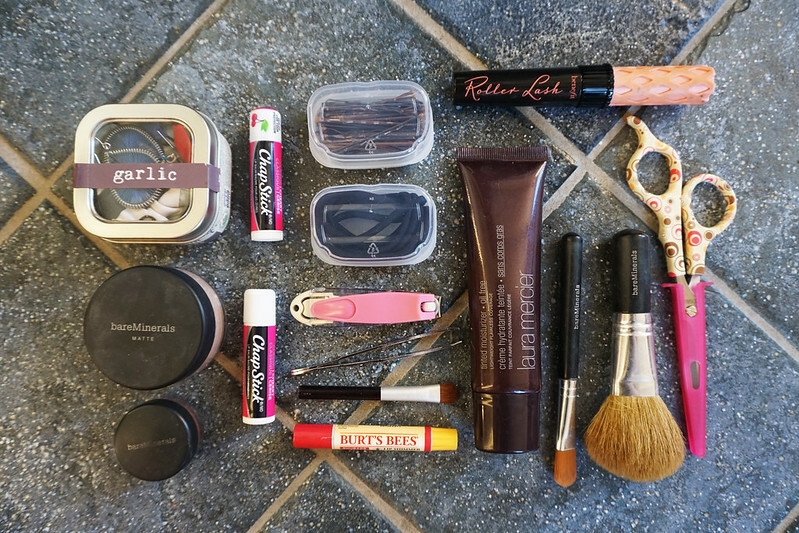 Beauty supplies: chapstick, foundation powder, tinted moisturizer, eye shadow, makeup brushes, scissors, tweezers, nail clippers, bobby pins, hair ties, mascara, small container of jewelry. Office: computer, 2 sets earbuds, external hard drive, tablet, cords, pens, screen cleaning cloth, USB, 2 notebooks, iPod, business cards, book, camera (not pictured), folder with our upcoming tickets, reservation information, passports, etc. Luna’s packing list: carrier, Wagwear shoulder bag, epic wipes, tennis ball, shampoo, poop bags. Sport equipment: folding bicycle, extra tire, extra tube, bike repair kit, helmet. Other: flashlight, tape, medical stimulator machine for my bum shoulder, baby wipes, tea bags, reusable grocery bags (which I use like packing cubes while traveling and then use as grocery bags in each place), small bags of spices (currently: cumin, cardamom, cinnamon, salt, pepper), small bag of baking soda (to clean stubborn pans), 1 spoon (for on-the-go meals), 1 knife (again, on-the-go meals). Good way to look at it. We are carry on only types. BUT we do not travel full time as you do. 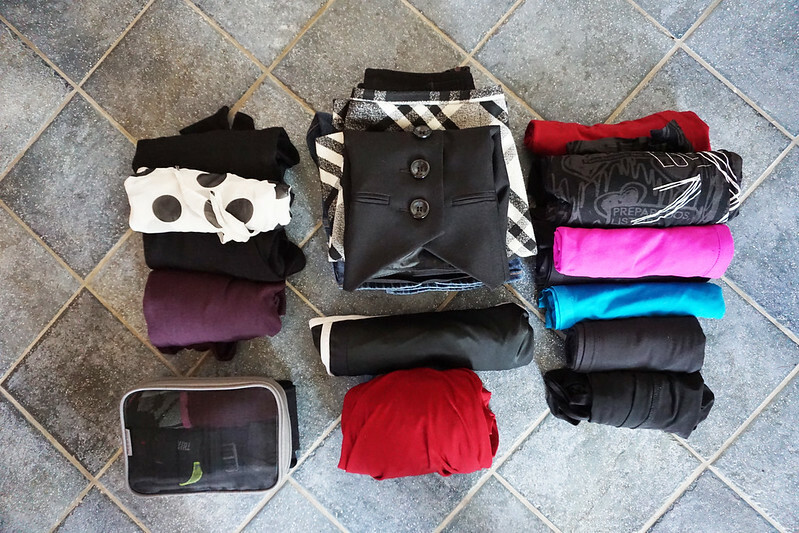 So yes, for us – even if away for 1-2 months we will pack only a carry on each. Having been re-routed to many times resulting in lost or severely delayed bags – can’t bring myself to go any other way. Like you said it works for us. It’s our way. I always have one dress that can go from day to night. I have sandals that can go from flat to heels! I don’t travel with toiletries for more than a week supply opting to buy them on location. No dry clean only items etc. Yes! I totally get that. When I had a home base in Switzerland, I traveled a lot lighter, always able to leave things like seasonal clothes at home. How you travel and for how long also dictates quite a lot. I love these posts. 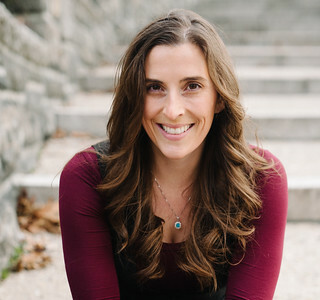 I’m learning to downsize so I too can do some slow traveling and the information here is helpful as I think about my own needs. If you don’t mind me asking, what do you use for a day bag and/or purse once you’ve arrived? I know I might want to work in a cafe one day, but also go out and about with hauling a giant backpack around. Any ideas? Also, did you choose your clothing knowing you’d use just those things or with the idea of buying a few items while you’re on the road? Thanks! I’ve tried a lot of things over the years and currently landed on carrying a small backpack (as lightweight as possible), which is also what I use as my carry-on (see the photo in the post of all our bags – it’s on top) and when I’m going out in the city and don’t want to look like a redneck, I carry a purse (also lightweight and the biggest requirement for it was that it match every single thing I wear and that it fold up to be transported in my main bag during flights/train rides). Right now, my backpack contains 7 tshirts/shirts, a pair of jeans and 2 shorts, several socks and undies, a pair of nikes and a flip flop. My clothing keeps getting lesser and lesser the longer I travel! :) My general rule is to pack for a 4 day trip regardless of how long you are planning to travel for, because you can always do laundry or have an excuse to buy that cute souvenir tshirt (if you really want to). For sure. I do find that for long-term travel, doing laundry every four or five days ends up being a bit impractical. But for shorter trips, easy peasy! I’d say if you use everything in your bag AND you can carry it yourself :) It’s just rude to expect someone else to carry or lift your bags. I’ve given up on carry on only because all the budget airlines out of Australia now have a strict 7kg total allowance. That’s impossible for me. Maybe for a one week vacation but not for long term travel. I carry a lot of toiletries. I used to just pick things up as I traveled but I committed to only using cruelty-free products last year and they can be hard to find in Asian countries. Oh, and as for day bags, I use this one – https://www.fallindesign.com/monopoly-all-in-one-organizer-for-laptop-and-accessories/ constantly. It’s the first bag I’ve had that actually works well for me and keeps my stuff organised. The real selling point though was that it has a loop inside so I can hold a water bottle upright. I have a big fear of drinks leaking in my bag. Oh my goodness, I love, love, love this post! It’s just what I’ve been wanting to see more of. I guilt myself for having my life in my bag sometimes, but that’s where it is and I need everything in it. Your post is an especially important reminder for celiacs (or anyone with medical needs), vegans, and those who care about using eco products in general…what we need is just not always available wherever we go and constantly buying disposables is so painful for the earth.